A NEW survey shows the surging popularity of plant-based milks and how the precocious market is fine tuning issues to do with calcium and protein fortification and labelling. The category has grown by a staggering 58 per cent in number of products in the past two years, but health professionals are saying that not all “mylks” are nutritionally equal. The audit of 112 products on shelf in the four major supermarkets was carried out by the Grains & Legumes Nutrition Council and published this month. It included nut milks, grain milks (e.g. oat, rice), legume milks (e.g. soy, pea), coconut milks and mixes, and reviewed all on-pack nutrition information. Since the last audit of its kind in 2016, the number of coconut milk products has more than doubled (220 per cent). 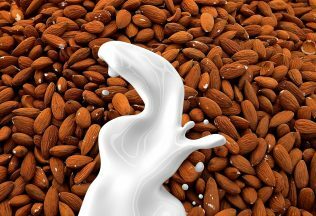 The nut milks have increased by 90 per cent, with even the well-established legume milk category growing by 36 per cent. But compared to dairy milk, the council’s nutrition manager Felicity Curtain said some plant-based milks don’t stack up nutritionally, with many falling short on valuable calcium and protein. “Thirty per cent of products did not mention calcium on-pack, suggesting they weren’t fortified with the important mineral. Garlo’s Pies are trialling its new ‘Muscle Pie’ which is described as being high in protein.